The U.S. economy added 243,000 payroll jobs in January 2012 and the unemployment rate fell to 8.3 percent. One month does not a trend make, but the past several months of data show a labor market that is recovering, and an economy that has been accelerating even as fears of a double-dip recession rose. For those of us who believe the U.S. economy is performing better, stronger and faster than its peers in the developed world, and than many pessimists expect, this is something of a vindication. Positive payroll number. The economy created 243,000 jobs. There was no great post-Christmas season let-down in hiring, as many analysts expected. Strength was across the board. Manufacturing added 50,000 positions. Health care and education added decent chunks of jobs, per usual, but professional services added 70,000 and retail added 10,000 jobs. Average weekly earnings rose a bit, and were up 2.5 percent from January 2011. The conservative recovery continues. Once again, as has been the case for much of the past two years, employment growth is coming about in spite of government spending, not because of it. As states, cities and the federal government have embraced austerity, employment in the public sector has been falling. 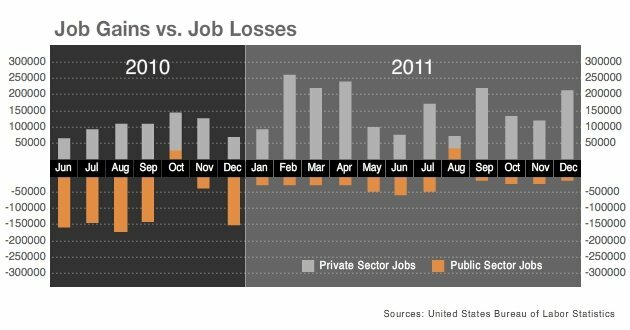 As the accompanying chart shows, pretty much every month, the private sector adds jobs while the public sector subtracts payroll positions. 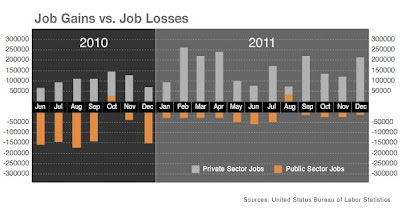 Between May 2010 and January 2012, the public sector cut 1.024 million jobs while the private sector added 2.245 million. The trend continued in January, with the private sector adding 257,000 and government cutting 14,000 jobs. The trend remains the friend. Each month, the Bureau of Labor Statistics revisits the data from the previous two months and revises it. Every January, it looks back over its statistics and revises previously reported statistics. This month, the data were generally revised upwards. November's jobs number, originally reported as a gain of 120,000 in December and revised to 100,000 in January, was revised to 157,000. December's gain, originally reported as 200,000, was revised to 203,000. That's an additional 60,000 jobs. And the so-called benchmark revision resulted in a revision of the December 2011 employment figure upward by 266,000.